Easy Disney Craft for Halloween - Mickey Mouse paper pumpkin with full photo instructions. Step-by-step photo instructions for this easy Mickey Mouse inspired paper Jack-O-Lantern. You probably have all the supplies on hand and construction is very simple. This cute Halloween craft is appropriate for children and adults, though small children may need help cutting the construction paper strips and leaves. You can put this together in just a few minutes or make several pumpkins and group them together. Disney World has the Mickey's Not So Scary Halloween Parties in September and October. You can host your own Not So Scary Halloween Party and do this craft before showing a Disney Halloween movie like The Adventures of Ichabod and Mr. Toad or Halloweentown. Photo credit: All photos are my own unless otherwise noted. Supplies to make a Mickey Mouse Paper Jack-O-Lantern: Orange construction paper, green construction paper, a toilet paper tube, scissors and transparent tape,or craft glue or a glue gun. Cut a toilet paper roll in to a 2.5-inch length. and cut a strip of orange paper into a 3-inch strip that is long enough to wrap around the toilet paper roll. Tape the orange paper so that there is a half inch above and below the enclosed toilet paper roll. We're using tape to make this a safe craft for children but adults or older children could use a glue gun instead of tape. You could also use craft glue but you'd have to allow time between some of the steps for the glue to dry. 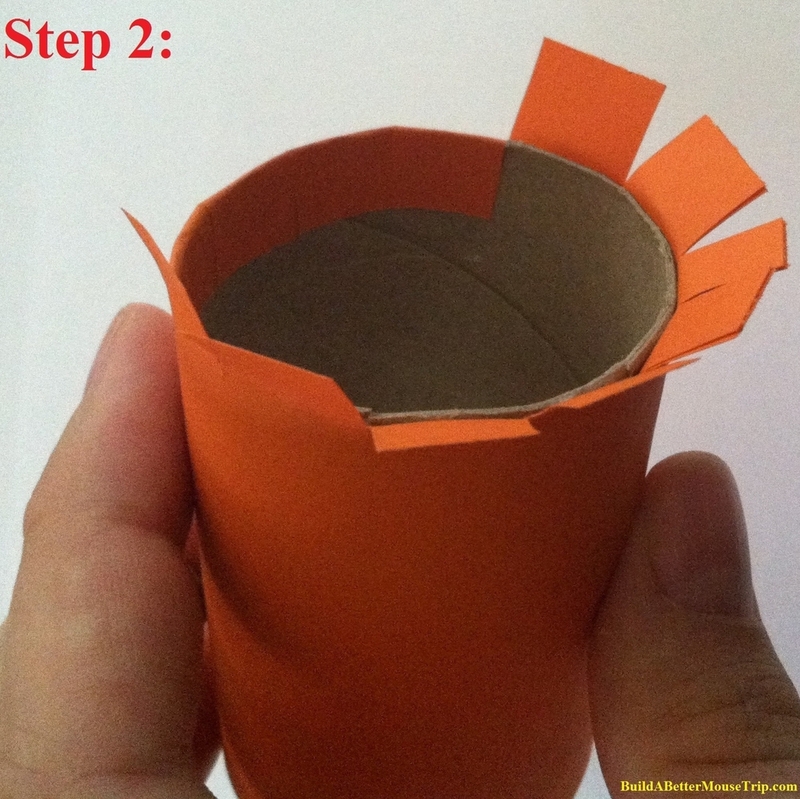 Cover a toilet paper tube with orange construction paper. Cut slits in the paper that extends past the ends of the tube, fold extra length over and attach to the inside of the tube using tape, craft glue, or a glue gun. Cut slits on in the orange paper above and below the toilet paper roll. Fold the tabs over and tape in place inside the roll. Orange construction paper strips form the body of your Mickey Mouse pumpkin. Tape an orange paper strips inside the toilet paper roll at each of the four quarter points in the circle; think of it as North, South, East, and West, if that is easier. 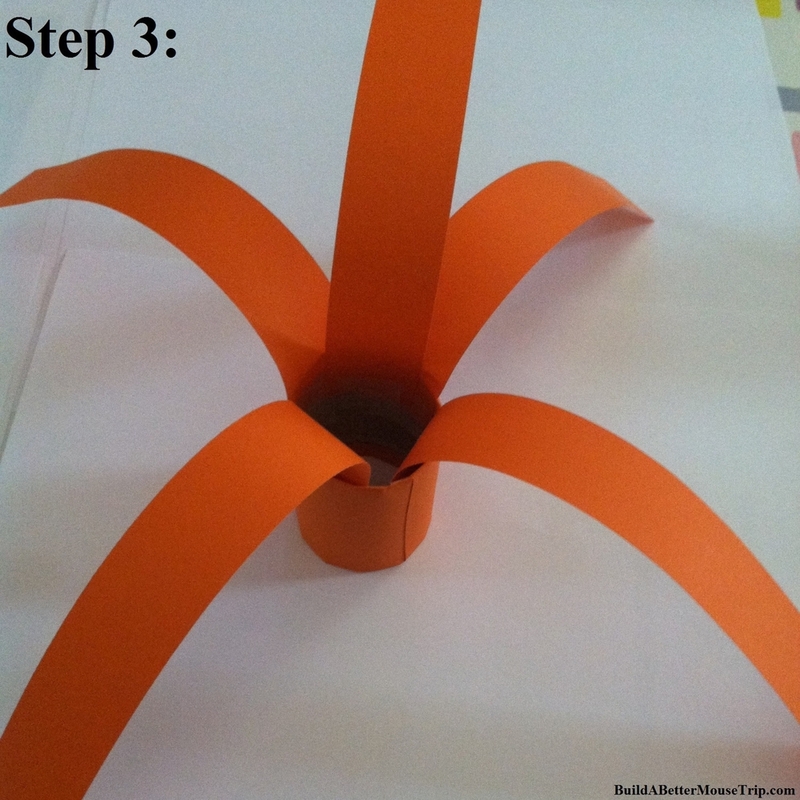 Then tape an orange paper strip in the space half way between each of the first four strips. 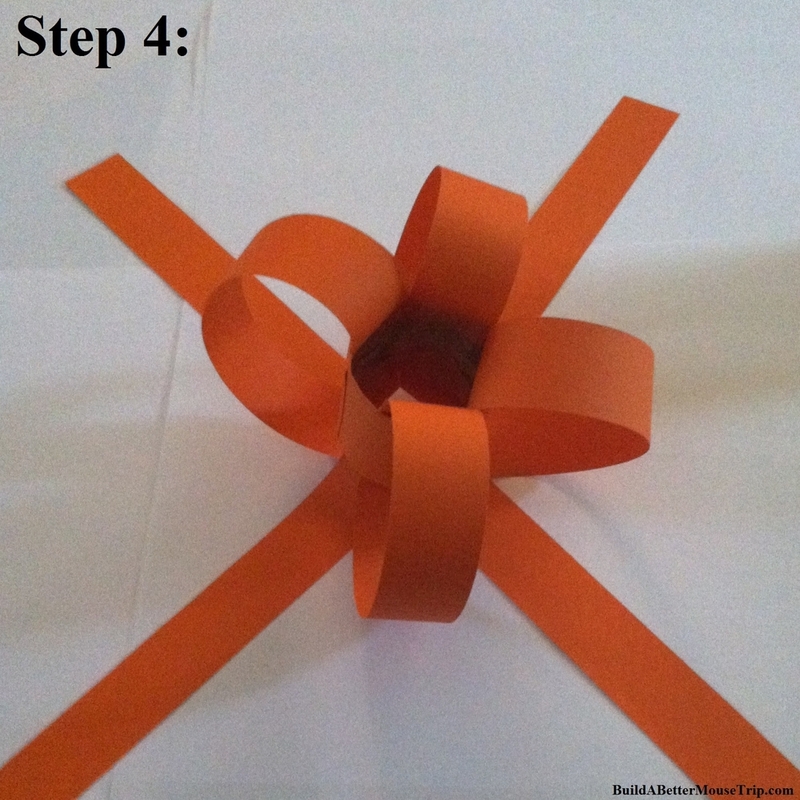 Step 4 - Attach one end of an orange construction paper strip to the inside of the bottom of the center tube and the other end to the top, using scotch tape or a glue gun. Once the top is done, turn your craft over and tape the loose ends into the other end of your covered toilet paper roll, forming the body of your pumpkin. Step 4: Bring all of the orange construction paper strips down from the top of your pumpkin to the bottom and attach, making a nice round pumpkin shape. Once you’ve taped the paper strip at the top and bottom, your pumpkin should look like this. Step 5 - Cut a leaf out of green construction paper. Draw a leaf on a piece of green paper and cut it out. You can cut it out free hand, if you’re feeling confident. 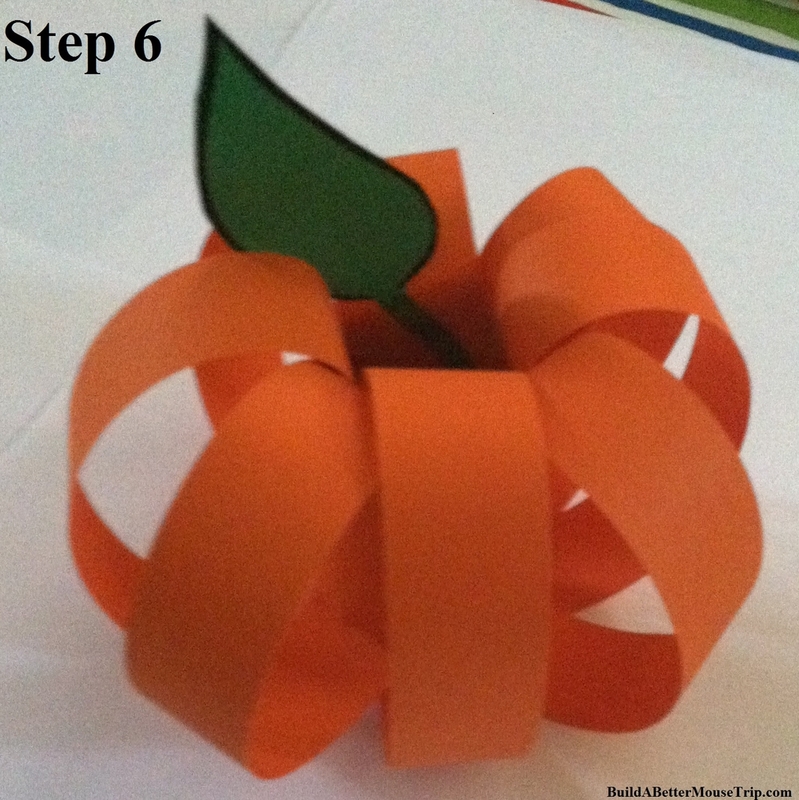 Step 6 - Add a leaf to your paper jack-o-lantern. Use tape to attach your leaf to the top of your pumpkin. Step 7 - Make Mickey Mouse ears for your pumpkin from 2 strips of orange construction paper. 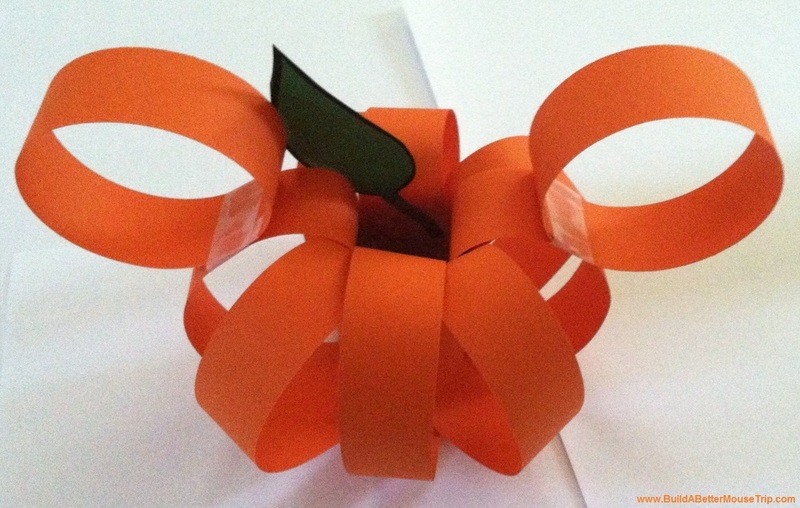 Make 2 circles Mickey ears with the last two strips of orange paper and tape to hold. Position each ear on your pumpkin and fasten it in place with tape. Your project is complete once both ears are taped in place.